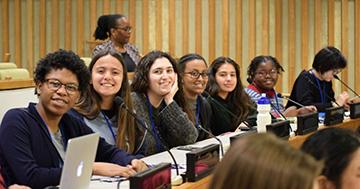 Two DePaul Cristo Rey seniors and teacher Jessica Ebert have returned from a week in New York City participating in the United Nations Commission on the Status of Women (CSW). Representatives from around the globe convene annually for the CSW to promote gender equality and the empowerment of women. Seniors Wintana ’19 (fourth from left) and Malikah ’19 (first on left) were chosen to represent DPCR as both were instrumental in founding, sustaining and leading DPCR’s student group W.H.E.N. (Women's Rights, Help & Support, Education and Tutoring, Needs and Feelings). The opportunity to participate in the CSW was offered by a local representative of The Grail, an international women’s movement with a community in Loveland, Ohio. The students stayed at The Grail House in the Bronx with other young women from around the world. While at the CSW, the two students helped to host and participate in an event called, “Girls in Action.” Wintana served as one of the moderators and Malikah sat on a panel addressing her experience as an African-American girl in 2019.